The National Fire Protection Association 96 2008 standards state that "the entire exhaust system shall be cleaned by a properly trained, qualified, and certified company or person (s) acceptable to the authority having jurisdiction..." (emphasis supplied). Check your with your local fire marshal to see if your jurisdiction requires hood cleaners to be certified. Remember, even if your locality does not require certification, another "authority having jurisdiction" is the insurance companies that cover restaurants. They may also require that their restaurant be cleaned by a certified professional. EHoodCleaner recommends obtaining your hood cleaning certification through the Certified Hood and Duct Cleaners Association, headed by Russell Clark, a board member of the NFPA. This is an on site intensive hands on training course offered by Advanced Cleaning Systems. All classes are taught at our school located in Nashville, TN. Best For: Seasoned hood cleaners (business owners or employees) with at least 1 year of hands-on experience. Please Note: Fixed fire systems certification or hood cleaning installation knowledge does not qualify. The exam is proctored at your location. The application fee, including one-year membership in the CHDCA, costs $250. Visit the Certified Hood and Duct Cleaners Association Now! 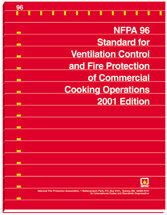 We enforce NFPA 96 Code Standards.